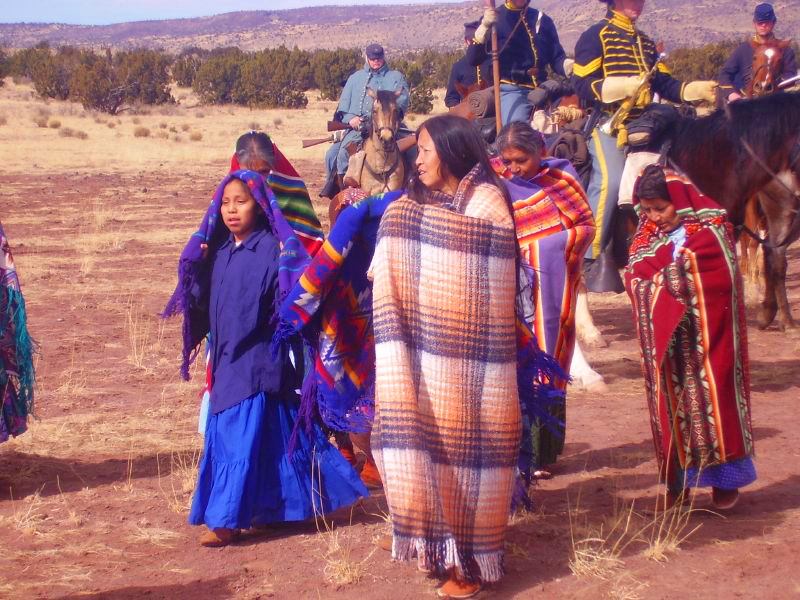 The Alamo Navajo Indian Reservation is truly a step back in time. Navajo culture abounds in this remote community which is located 29 miles north of Magdalena. Scroll down to read more about the Alamo. Denise Ganadonegro elaborates. She thinks of isolation as being far from services, and almost every service you could need — health, education, housing, social, economic — is available right here. Besides that, “Do you notice any unfinished projects here?” she queries. Well, now that she mentions it, no. Everything looks as if it was either just built or has a fresh coat of paint: the teacher apartments and wellness center, whose geometric lines and color combinations would turn heads even in Albuquerque; the spacious mini-mart, the chapter house, the glistening football field and track. Here in the center of town, there’s not even any graffiti. “I don’t agree with graffiti,” Ganadonegro says in a tone that makes you hope you aren’t doing anything she disagrees with. The closest thing to graffiti are the dozens of names signed neatly on the cement footing of a retaining wall around the chapter house, but they look like they have permission to be there. Where are the 2011 and 2012 kids? There aren’t any. The chapter saves up its Youth Employment funds until it can afford to hire every kid in town who wants to participate. However, for service-minded youth stuck in an off-year, there’s always the Youth Conservation Corps, which built the cute adobe wall along the road to the school. Perhaps isolation is not such a bad thing: Left to their own devices, separated from what they call “the big reservation” by several Pueblos, a couple of struggling white and Hispanic hamlets, and the Cibola National Forest, the people of Alamo, young and old, have taken ownership of their community. They have certainly made up for a lot of lost time. Electricity did not come to Alamo until 1967, the first paved road until 1982, and — perhaps most shocking for such an isolated existence — phone service did not extend to the 63,000-acre reservation west of Socorro until 1987. Indeed, a lot of the improvements you see today date back no further than two or three years ago. The football field was just dedicated Aug. 24. Originally from Mariano Lake, N.M., Greyeagle is the security guard for the new IHS wellness center, but his badge is signed by the Alamo Navajo School Board. “I have to deal with two bosses from two very different corporate cultures,” Greyeagle complains. But he owes his job — along with the majority of the employed chapter members living here — to the Alamo Navajo School Board. While the chapter is the nominal government — and no one can deny Ganadonegro runs a tight ship — the de facto government of Alamo is the ANSB. The chapter has found an ingenious way to funnel state, federal and county money through the board into myriad projects: the football field, the mini-mart, the wellness center … even a glossy brochure that explains it all. “Separated geographically from ‘Big Navajo,’ the Alamo has long been the stepchild of the Navajo Nation,” the brochure charges boldly, “largely neglected by the Bureau of Indian Affairs as well as the tribal government. 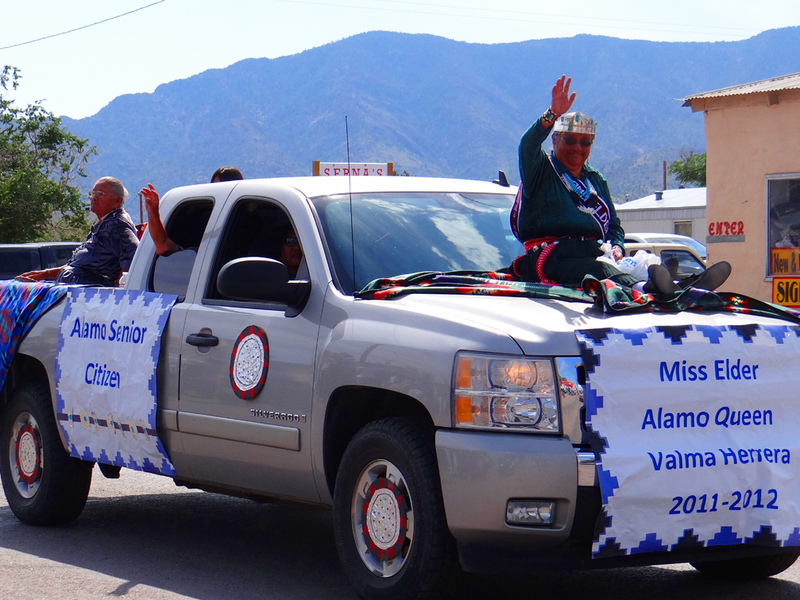 With the passage of the Indian Self-Determination Act in 1975, some sharp-eyed Alamo leaders read the fine print and saw their loophole to freedom. If the band could field a bureaucracy outside the tribe — or maybe just designate an existing one — to receive and distribute government money, it could circumvent the tribal bureaucracy and build projects without waiting for Window Rock to remember Alamo. Unlike some counties in Indian Country, Socorro County was supportive and eager to help out, the locals say. The band took the bold step of concentrating the power in the hands of the school board, banking on the fact that the community was small enough (about 2,000 members at that time), to know everybody and elect the most untainted, forward-thinking, altruistic, cream-of-the-crop leaders to go after the projects the band needed. Which was darned near everything. A radio station? Yep. Over at KABR (Alamo Band Radio) 107.5, three energetic middle-aged women are keeping the band informed and entertained in English and Navajo. They’re delighted to host fellow journalists. “The Navajo Times? Really?” asks Ramona Guerro, the compact, sneaker-wearing announcer/producer. Guerro lost her father to diabetes and changed her life, dropping 40 pounds and becoming a personal trainer at the wellness center. Now she trains a much larger audience with shows on health topics and clever PSAs featuring the heroes Insulin and Big M battling arch villains Sugar Rush and Lardo. The KABR ladies happily show the Times crew around the station and then take turns taking their lunch hour so they can show us around the entire Alamo rez. Less than half a percent of the big rez sounds small, but Alamo is made up of seven different settlements with cryptic names like “Word of God” and “UFO.” Word of God, we discover, is named for a church there; UFO got its moniker when a group of frightened locals mistook a candlelight vigil on a far-off peak for an alien invasion. Alamo itself used to be called T’iis Tsoh, Big Cottonwood Tree, for a tree that marked a spring where people originally settled; you can still see the foundations of old stone hogans there. Whether the ancient t’iis still exists is up for debate; station manager Sarah Apache leads us all over the wash looking for it and finally concludes it has been washed away in a flood, but Alamo Community School’s language and culture teacher, Jackson Pino, insists it’s still there and we must have just missed it. Pino is pretty much Mr. Alamo, the go-to guy for questions about history and culture. He has collected reams of oral histories since the 1980s and plans to write a book some day. Which is good, because Alamo history is awfully murky. Esther Toledo, Alamo’s oldest resident at 94, tells the most common version we’ve heard: the Diné coming back from Fort Sumner were attracted by the flowing spring and protective isolation of the area and settled here rather than make the long trek to Window Rock. There are numerous other versions, however: Navajos hunted by Kit Carson in Canyon de Chelly escaped through a southern-trending side canyon and fled south; Diné getting wind of the roundup hid out among the Zuni before ending up at Alamo; a group of about 100 Navajos being held at Fort Wingate escaped and fled south on horseback. It’s possible, says Pino, that all the stories are true; that people came to Alamo a number of different ways at different times. There is another set of stories, however, that Pino finds even more fascinating. There are those among the Alamo elders who think of themselves almost as a separate tribe. Certainly there was plenty of intermarriage with both groups; one has only to look at surnames like Apachito (“Little Apache”) and Ganadonegro (“Black Cattle” in Spanish), and the prevalence of the Chishi (Apache) clan. Pino says if you listen to the elders of Alamo speak their language, you can hear traces of both an Apache and a Spanish accent. Asked whether the Alamites are the descendants of the “Enemy Navajo” who collaborated with the Spanish against members of their own tribe, Toledo is emphatic. Pino believes there probably were some who conspired with the Spanish to raid the Pueblos and other Navajo bands, but this was hardly a unique situation. Pino believes the big and little rezzes need to put aside their differences and fight the real battle: the battle to save the culture. For a while, he says, Alamo was protected because of its isolation and lack of technology, but now its children are losing interest in the old ways. For the youth’s part, a lot of them see little reason to stick around their isolated homeland, in spite of their community’s best efforts to keep them here with evening classes, the wellness center and the new football field. Four young men hanging out at the mini-mart (another School Board project) complain that there is little to do besides hang out at the mini-mart until it closes, then head to the wellness center, where Greyeagle says some of them are more interested in picking fights than using the equipment. “I’m just waiting to find a construction job so I can get out of here,” says Emilio Pino, 19. His cousin Estevon Pino, 20, says he would have left already if not for the rodeo circuit. Among the steer-roping crowd, he’s pretty famous, having appeared in “Super Looper” magazine. But maybe, for the youth of Alamo, the itch to roam is nothing new. Toledo remembers it.